So I was watching the news a little while ago and I heard quacking outside my living room windows. Which isn't odd, because I have a family of Florida mallard ducks (three males, one female) that come around and eat the bird food. I stood up to see which ducks were out there and instead I see THE CUTEST THING IN THE WHOLE WIDE WORLD!!! WEE LITTLE BEHBEH DUCKS!!! EIGHT OF THEM!!! They are soooooooooooooooooooo very cute. This was the best photo I could get. When I went outside to throw some bread out for mama duck she quacked that the kids were to huddle together (awww) and then march calmly down to the pond ahead of her (awwwww). ETA: I just had to go yell at a group of kids for throwing things at the ducks. THROWING ROCKS at BABY DUCKS. Jesus. I told them if they tried that again they'd be getting a few rocks thrown right back at them. 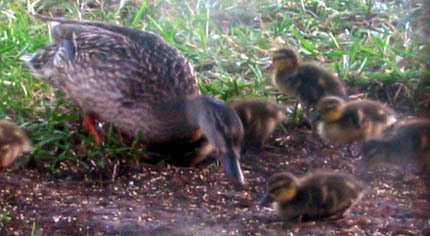 Aww, cute widdle duckies! I love ducks. Satan has a special place in hell for people who throw rocks at ducklings. Throw a rock at those punks for me too! Baby duckies are so cute! Evil children. Go get them! I hate those kids. And their parents too!